This all ages event (although liquor will be sold) will support your favourite non-profit, Soap For Hope! 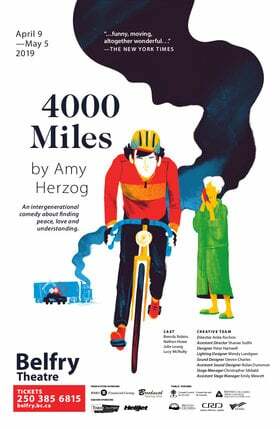 The event will be held in the Disaster Aid Warehouse @ 426 William Street. All ticket, CD, and merchandise proceeds going to the artists. A masterful songwriter collects life's experiences and artfully turns them into songs that capture the imagination of a listener. Declan O’Donovan is that songwriter, that contemporary troubadour who utilizes a broad palate of voice and piano to tell intriguing stories through the music he creates. 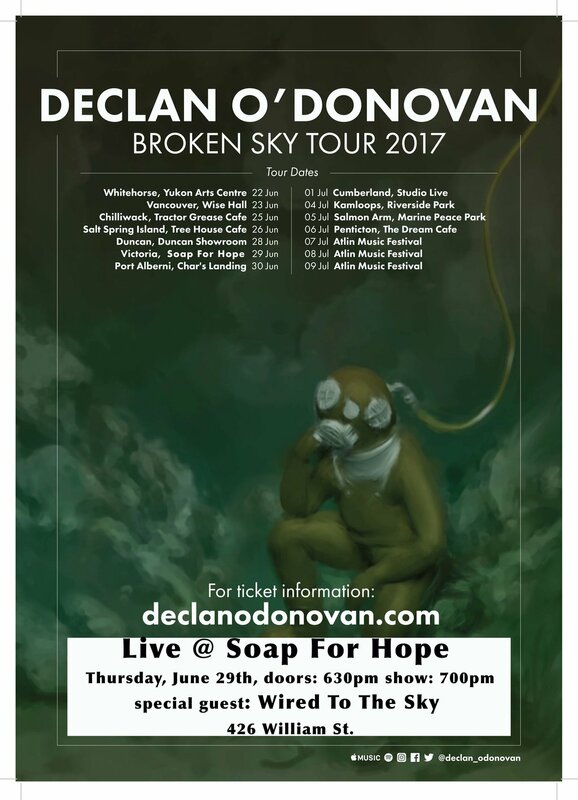 At home in the rural environs of Whitehorse, Yukon and equally at home in the urban centers of Montreal and Toronto, this broad sense of place comes into play in the songs Declan has written for his newest release, Broken Sky. “Overall, the sound of the album strikes a balance between the rural and roots, and the urban and contemporary influences that contributed to the sound and the songwriting,” says O’Donovan. Produced by Jean Massicotte (Patrick Watson, Lhasa, Adam Cohen), Broken Sky, was recorded at Studio Masterkut in Montreal. “Jean gave my songs a landscape to live in and explore. He brought with him a sound and an approach that gave every note warmth and direction, and he gracefully coaxed out performances from everyone involved that at once made the songs both grounded and unrestrained.” Featured among the many outstanding musicians on Broken Sky are Brad Barr of The Barr Brothers on electric and acoustic guitars, as well as Joe Grass of the Patrick Watson band on pedal steel, electric and nylon-string guitars. 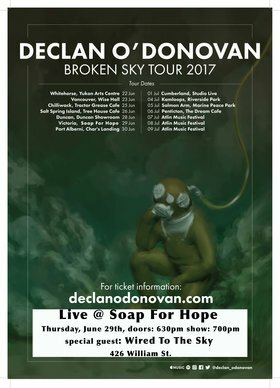 Declan is touring nationally and internationally in support of Broken Sky. In 2017, he is booked to play in Germany in March and May; at Fuji Rock Festival in Japan in July; and will be in Canada during the summer of 2017. He will appear at Canadian Music Week (Toronto), the Atlin Arts & Music Festival and will tour BC in July. Wired To The Sky is the newest project from Canadian songwriter, Dylan Perkons. 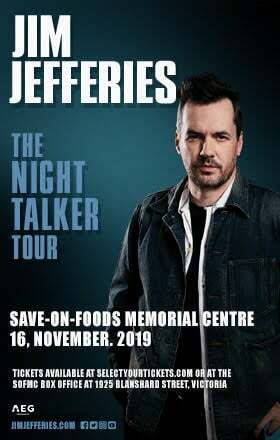 After relocating from Montreal to the West Coast, he began performing new material with a group of Vancouver Island musicians. In late 2016 the band entered the studio to record their debut album, produced by Juno Award-winner Colin Stewart (Dan Mangan, Black Mountain, Destroyer). The upcoming 2017 release, titled Steady Sparrow, Steady Flight finds Perkons' residing comfortably in a post-Americana landscape. Though his dusty baritone remains at the front and centre of the album, the dynamic arrangements carry the listener through the songs. Featured with him are core members Nevada Brown, Pat McTaggart, and Dave Thompson, alongside guest musicians Kathryn Calder, Laura Mina Mitic, Marc Jenkins, and Megan McCaffrey. Swaying between colorful indie folk, eerie psych blues, and blistering alt-country, the band compliments the earnest, somewhat melancholy writing woven throughout the songs. Wired To The Sky will be touring western Canada in summer 2017.